Sandra Watson Dottie Smith, Sandy Simmons, Nancy Green, Sara Brown, Donna Trivette, Cathy Hagaman, Linda Donner. A large group of young girls wearing matching costumes. 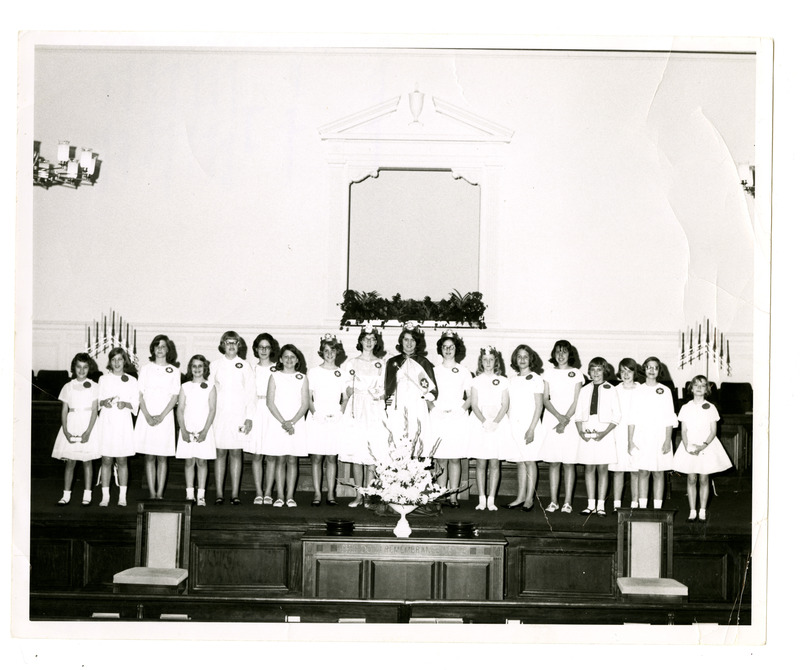 The girls are all wearing white dresses, tiaras, and starred badges with the exception of the girl in the center, identified as Miss Young, who wears a cape and carries a baton as well. The girls stand behind the altar at a church. The altar is engraved with the phrase "This do in remembrance of me" and has a large bouquet of flowers on it. A baptismal window lined with flowers can be seen behind the girls. On the back of the photo the girls are identified by their number from the left. 1. Unidentified, 2. Unidentified, 3. Gina Sanders, 4. Sandra Watson, 5. Dottie Smith, 6. Sandy Simmons, 7. Nancy Green, 8. Sara Brown, 9. Donna Trivette, 10. (No First Name) Young, 11. Unidentified, 12. Unidentified, 13. Cathy Hagaman, 14. Unidentified, 15. Unidentified, 16. Unidentified, 17. Unidentified, 18. Linda Donner. 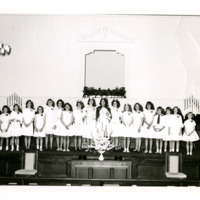 George Flowers, “Young Girls in Centennial Regalia,” Digital Watauga, accessed April 25, 2019, http://digitalwatauga.org/items/show/5837.